Social Media is a great way to build your brand, gain customers and more traffic for your business or personal profile. One of the easiest and most successful ways of maintaining a coherent social media presence is by using the same style and branding across all the channels, for instance using your logo, typography and colors from your website on your Facebook page in the banner and photo along with the same on Twitter, Pinterest and Google+ will help people easily recognize your content which encourages sharing and bookmarking. By spending a little time on the creation of your social profiles you can help elevate your brand above the competition and help place yourself firmly in the minds of customers. You can spend time creating all the different assets yourself or hire a designer to do it for you, but one of the easiest ways to achieve this is by downloading a social media pack. 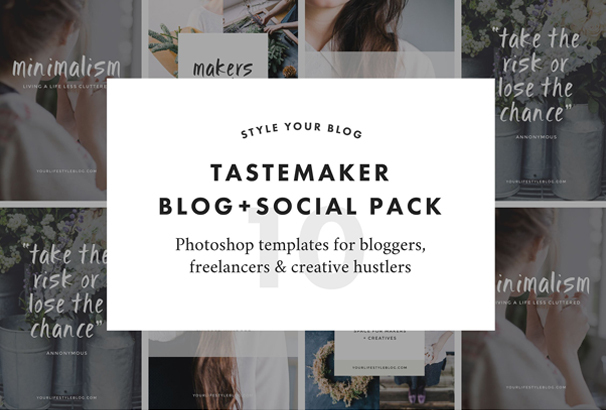 We have collected together all the best looking social media packs we could find in this post – simply pick the one you like and you can use the items for your blog posts featured images, create quotes and sharables for Instagram and Pinterest and use them to create your banner graphics for all your social media profiles. 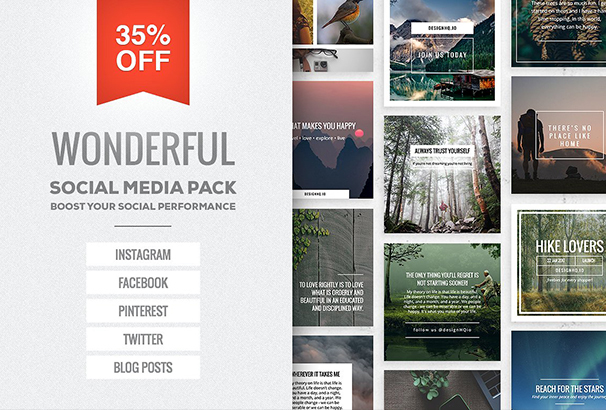 A beautiful multipurpose social media pack covering all bases with easy to use templates! Clean, modern and fully customizable, it is ideal for your website, blog and social media posts through Facebook, Instagram, Pinterest and more and has been fully optimized for each of these platforms. 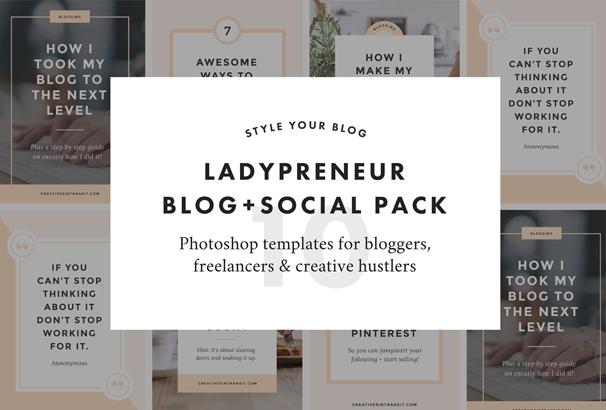 This is a super feminine, elegant and stylish social media pack perfect for fashion bloggers, beauty bloggers, lifestyle bloggers, fashion businesses, beauticians, and stylists. Promote your posts, business, sales and events on Facebook, Pinterest, Instagram and Twitter or add a beautiful image to your blog posts. 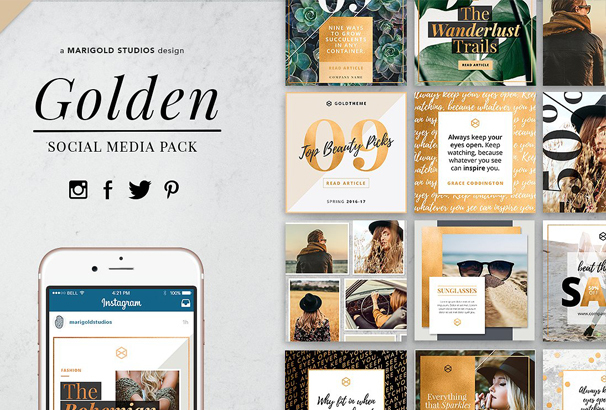 The Golden Theme Social Pack is striking social media pack perfect for fashion bloggers, beauty bloggers and many others. Promote your posts, business, sales and events right across social media with the help of this feature packed theme. 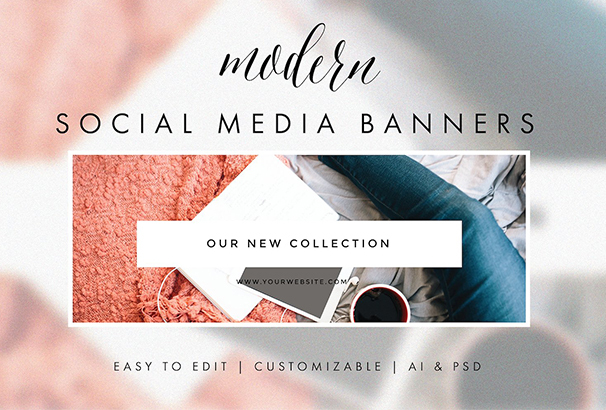 This collection is ideal for bloggers, graphic designers, photographers, interior designers, wedding planners, typographers and anyone who wants to share or maintain a brand online. Present your new logo design in style or use as a reference to keep your design consistent! 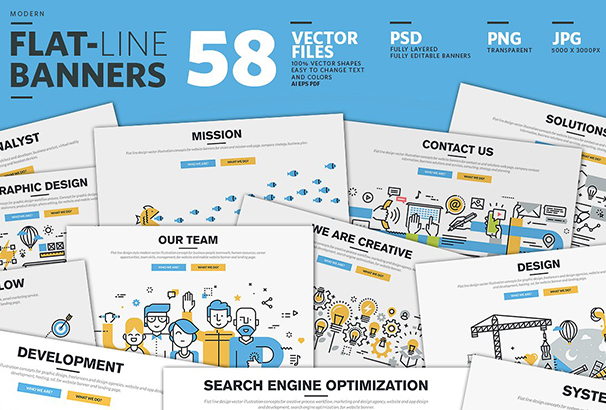 We have created the most comprehensive, design forward, social media pack for designers, creators, entrepreneurs and businesses to sell and promote through platforms like Facebook, Instagram and Pinterest. This one boasts a super streamlined design. 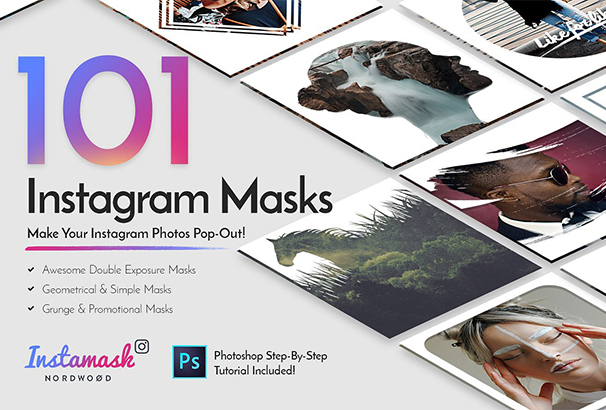 Make your photos look amazing and attract attention on Instagram instantly with this amazing InstaMask collection. Ensure that every photo you choose to share on Instagram has that eye-catching quality you need to attract likes, comments & new followers. 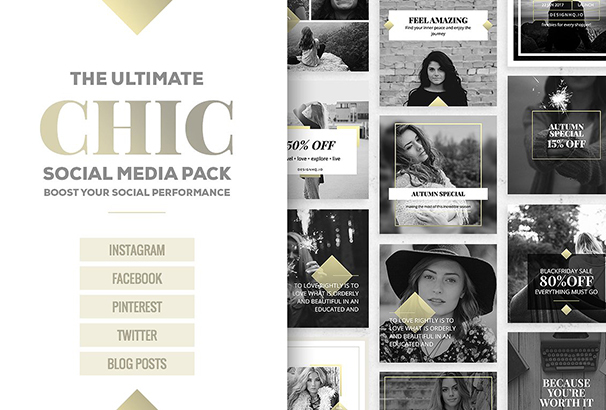 The Ultimate Chic Social Media Pack is an outstandingly useful product to help you boost your online presence. If you have just launched your new brand or business or perhaps you just need a little visual help with your current brand, the Chic Social Media Pack will help you get noticed with real style! Improve the look of your website, mobile app, blog or social media page and attract more clicks on your posts with the help of this great tool which has all you need to stand out from the crowd and present your content in a really stylish and beautiful way. 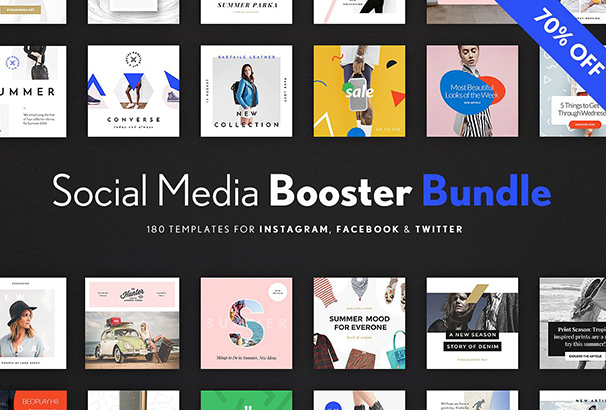 This is the biggest and most varied collection of social media templates and it’s now available for 70% off the regular price! Don’t miss out on this exclusive bundle as this is a time limited offer. 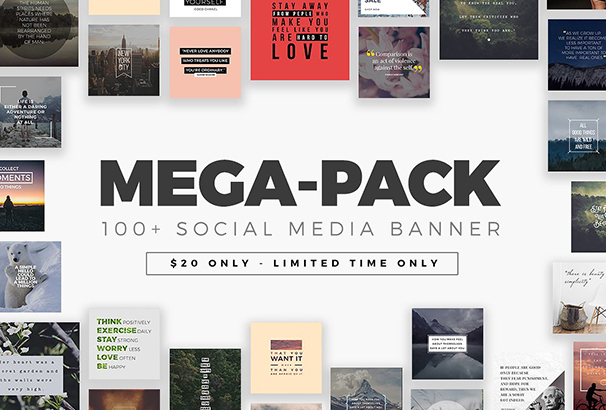 Creating your next social banner has never been so easy with this MegaPack Social Media Banner. This collection of 100+ unique designs come optimized for Instagram but also well compatible with other social media networks as Facebook, Pinterest, Twitter and so on. Social Media Booster Kit gives you all the tools you need to make your social media profiles more effective. 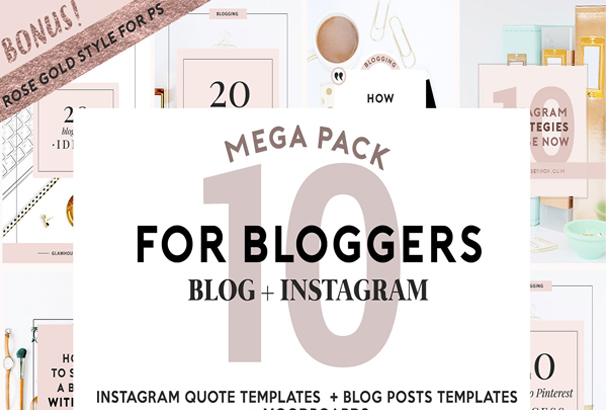 The product includes 15 templates designed specifically for Instagram, Twitter, and Facebook. 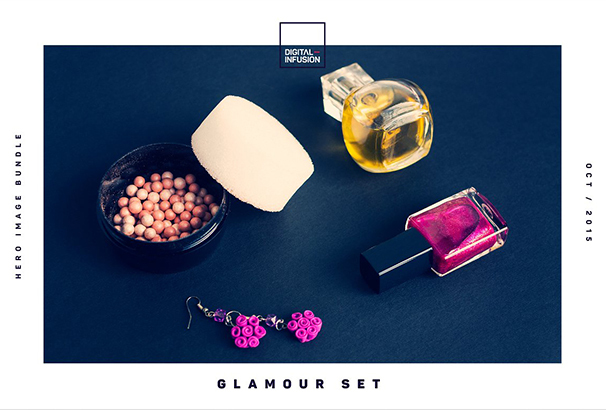 This set would be a great match for your personal or commercial needs: it is perfect for bloggers, fashion and retail brands, magazines and so much more. Stand out from the crowd and present your information on Instagram and Facebook in a striking and beautiful way. All banners are scalable and will fit any size required and you are free to use them as they are or create your very own banners in minutes. 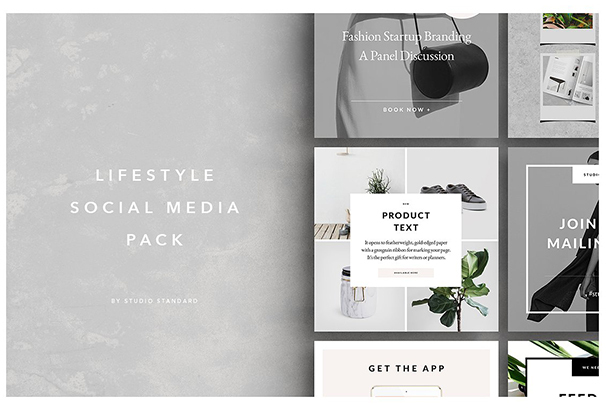 Give your social media accounts a design upgrade with the Studio Standard Lifestyle Social Media Pack. 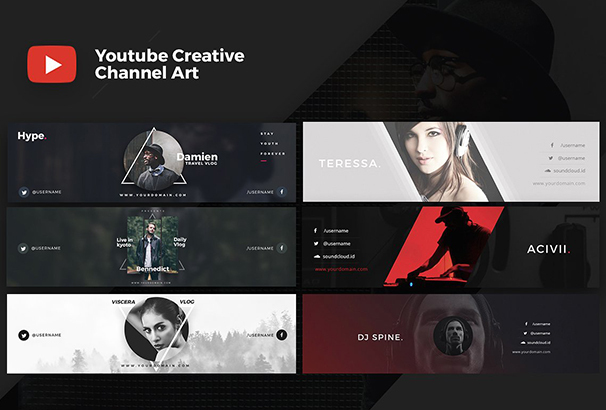 The pack contains 15 easy to edit, fully customizable social media headers, created in Photoshop and designed to place you center stage. 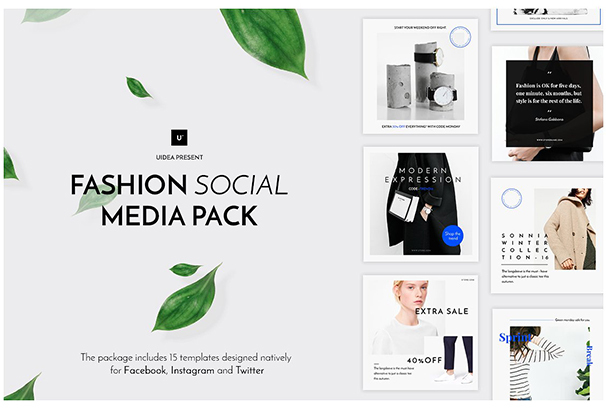 Give your social media accounts a design upgrade with the Fashion Social Media Pack. 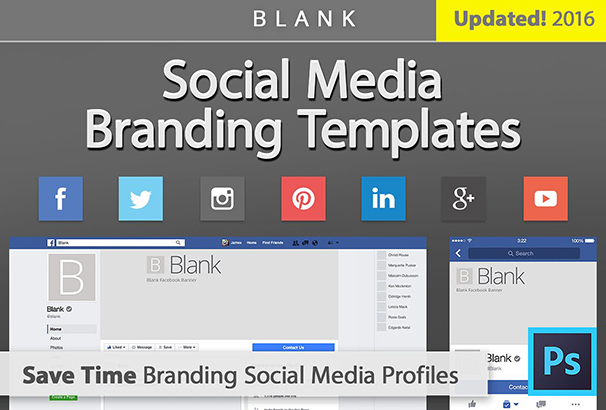 The package includes 15 templates designed natively for Facebook, Instagram and Twitter. Each of them is easy to edit and customize and will give your social media accounts instant style. 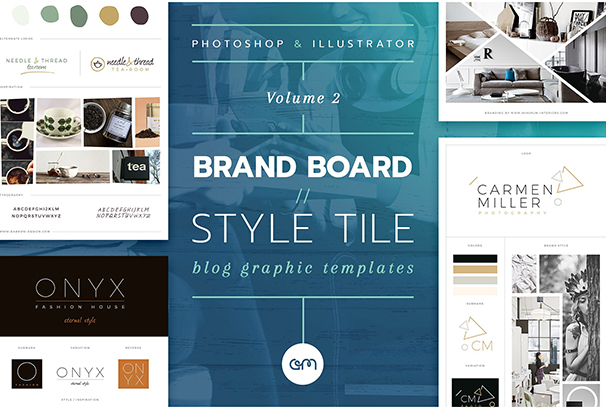 This collection of templates is ideal for bloggers, graphic designers, photographers, interior designers, wedding planners, typographers and anyone who wants to share their creativity online. They will make showing off your inspiration more fun and effective than ever. This template is suitable for any kind of business like Corporate Business, Agency, Creative, Blog, Magazine, Retail, Photographer, Artist, DJ, Freelancers and many others. It is very well-organized and structured so you can easily customize the design and color to your needs. Just launched your new brand or business? Or perhaps you just need a little visual help with your current brand? 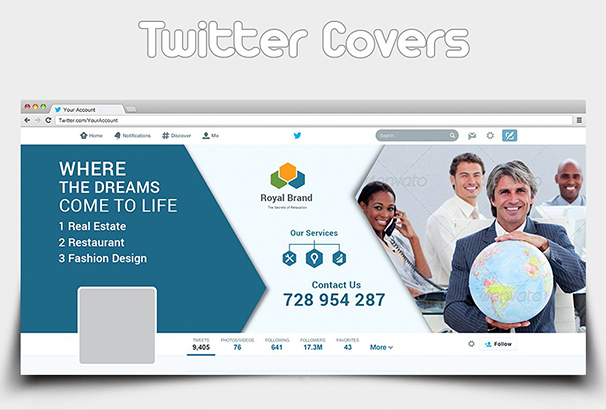 This beautiful high quality Social Media Pack you will get noticed with style and boost your profile online. 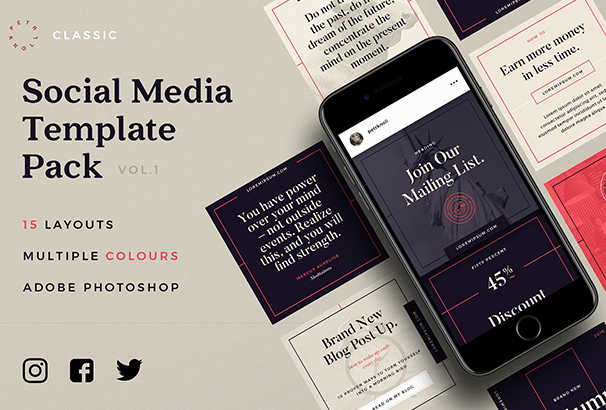 This great collection of premium quality templates works well with Facebook, Twitter and Instagram. 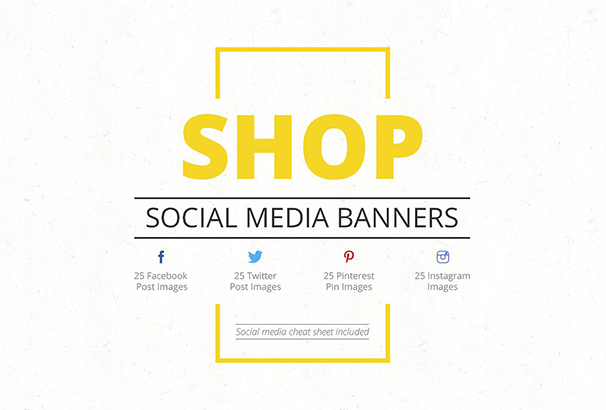 Intensify your online presence and make your social media profiles really stand out with this great collection. 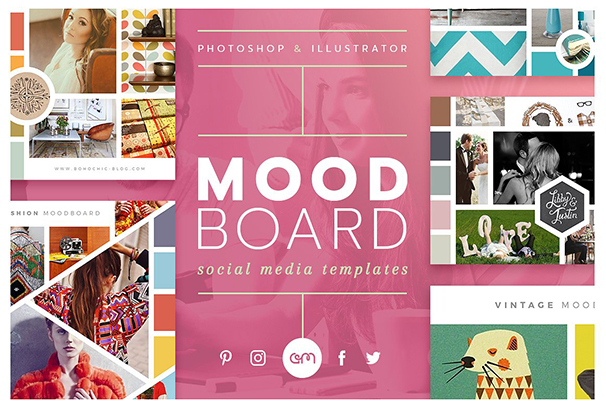 Ensure your Pinterest and Instagram posts get the recognition they deserve on with a little help from these irresistibly pinnable and beautifully designed blog header templates. 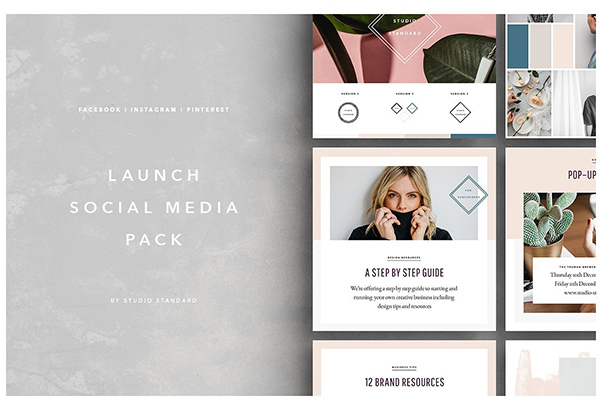 Let me introduce you to the Classic Social Media Pack – a collection of original templates for your social media and blog posts.The package includes 15 layout templates designed natively for Instagram, Twitter, and Facebook. Customization is made super-easy with the layers properly named and organized and there’s a How-to-use guide included for those not familiar with Adobe Photoshop. Are you a creative person? We are delighted to introduce you to one of the best creative Facebook timeline cover templates to help your profile really stand out. 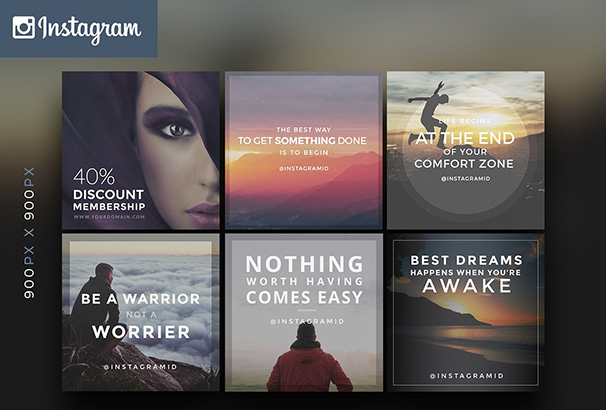 Engage your followers on Instagram like never before with a little help from this visually stunning template. This amazing collection of covers will inject real energy into your Twitter profile. They are fully customizable to suit your specific needs. 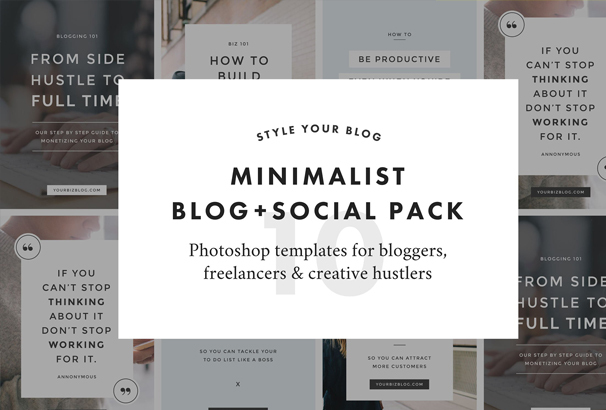 This fantastic bundle is minimal, clean, modern and affordable and has all you need to really polish your online presence across social media. 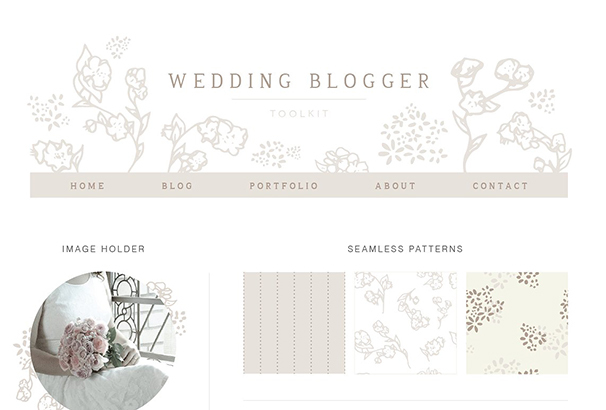 Use this blog kit to give your wedding blog an elegant and professional look. All elements are fully customizable for a truly bespoke result. 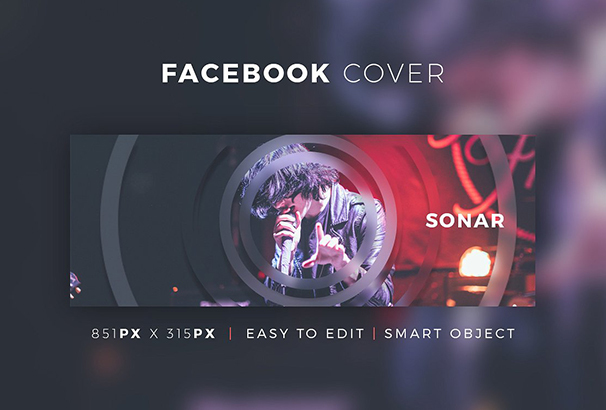 Make a big impact on Facebook with the help of this fully flexible cover which is incredibly easy to edit to suit your needs. 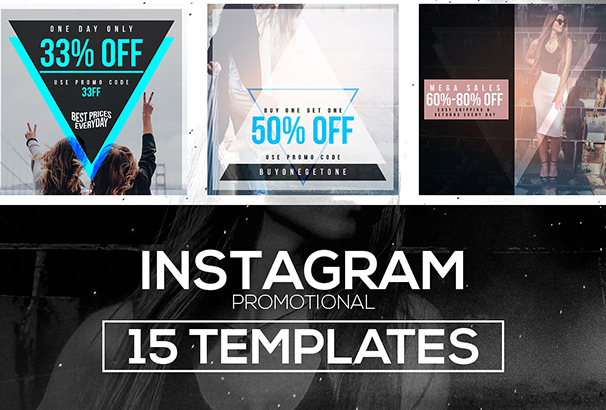 This is a collection of 15 visually stunning and fully customizable templates to help you market your promotions on Instagram more effectively than ever. 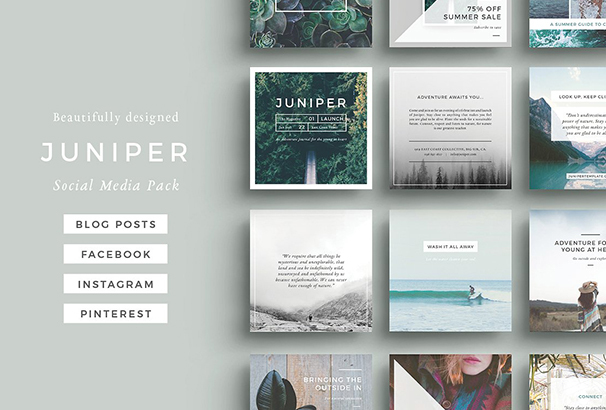 Crafted especially for use with Instagram and Pinterest, this fantastic collection of templates will help to give your profiles a sophisticated and sleek feel. Great content is wasted without the right packaging and these stunning templates have been crafted to help you maximize your blog’s potential. Want to dress up your blog or website? Try these stylish hand drawn social media icons which are fully flexible to suit your needs. 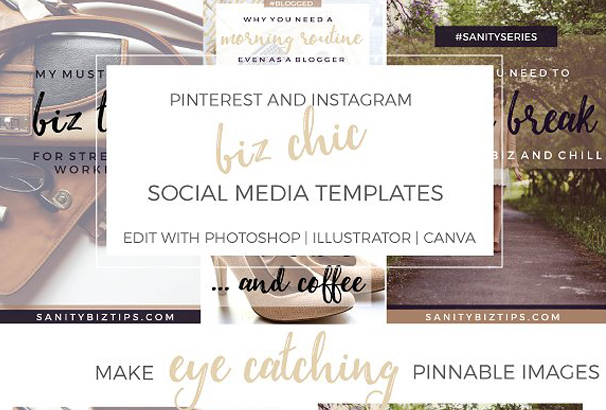 Get the recognition you deserve on Pinterest and Instagram with these irresistibly pinnable blog header templates! They may be just the tool you need to take your business or personal profile to the next level. 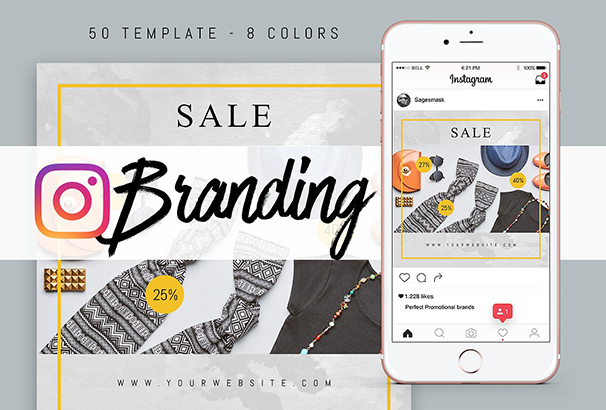 Renew your timeline today with 50 unique Instagram templates perfect for branding, product, promotions, fashion, ecommerce, blog or web. They are created with vector shape so you can resize them or print them in any size. 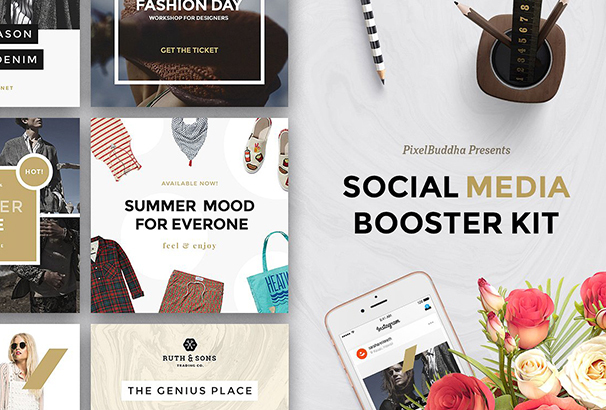 The Modern Package is a series of social media and blog post templates to help market your business in a clean, minimalist and cohesive way. This package includes different Photoshop and AI templates that you can customize to your liking. 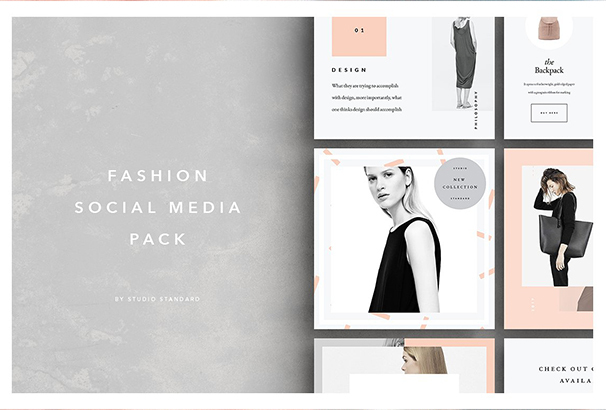 Give your social media accounts a design upgrade with the Studio Standard Fashion Social Media Pack. 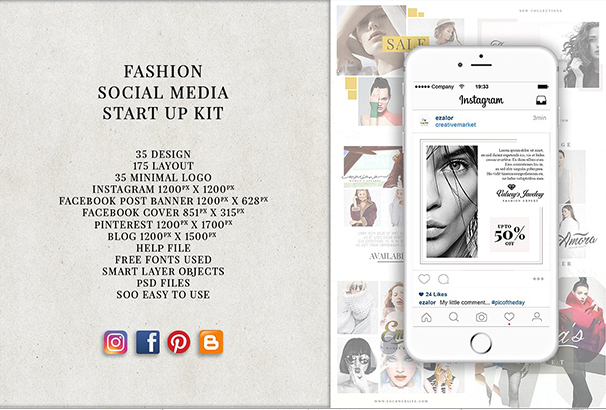 The pack contains 20 easy to edit, fully customizable fashion based social media headers, created in Photoshop and designed to stand out of from the crowd. Successful businesses today require beautiful visuals in addition to your amazing content creating a consistent message across your blog, website, online shop, and social media accounts. 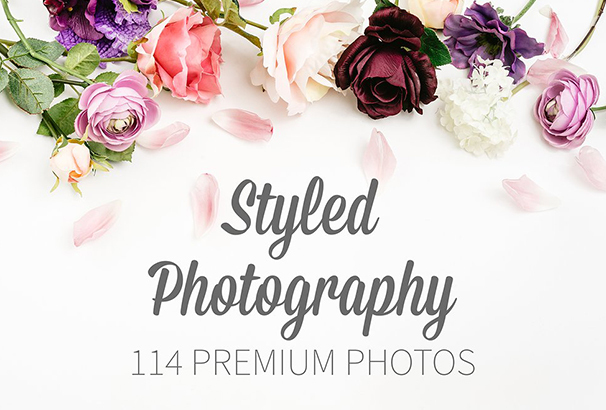 For that reason, we have prepared this highly styled photography pack that will really wow your audience. 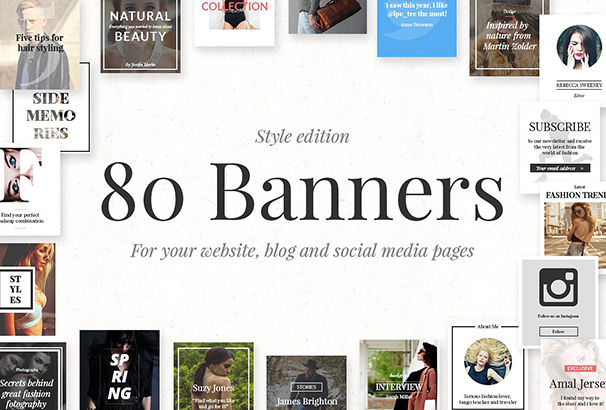 All the banners in this great collection are easy to use and highly customizable to fit your needs. Why not use them to start maximizing your online potential today? This amazing kit will help you inject new life into your social media presence. All templates are fully customizable to suit your needs. 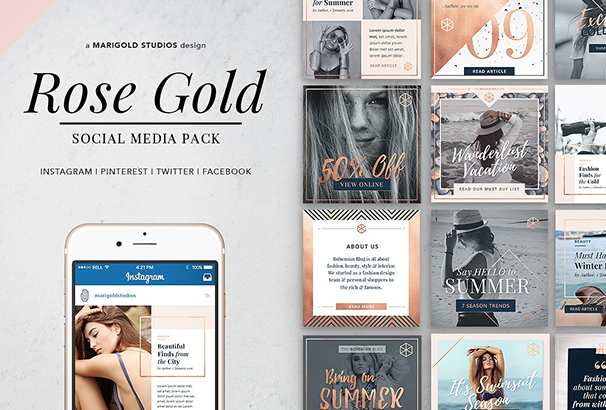 Make the most of your Pinterest and Instagram posts with a little help from this premium quality social pack when boasts an appealingly sleek and streamlined ultra-feminine design. 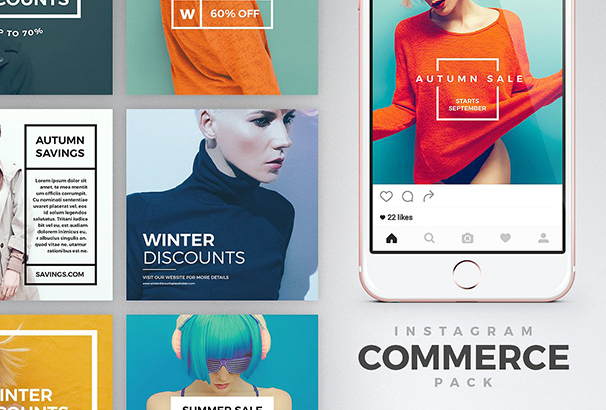 Instagram Commerce Pack includes 48 unique Instagram templates that are great for showcasing your store, advertising discounts or just adding an extra oomph to your posts. The pack requires Adobe Photoshop. 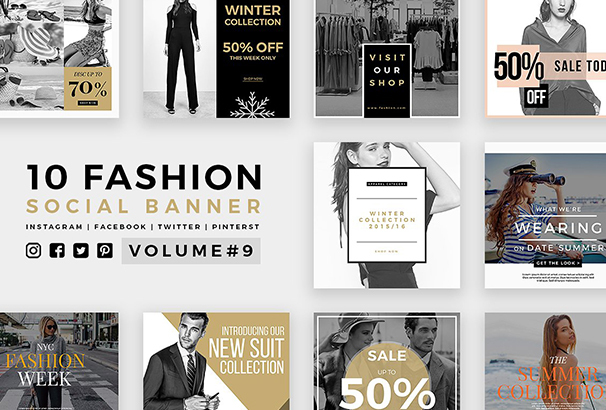 Creating your next social banner has never been so easy as with this Fashion Social Banner Pack 9 This collection of unique designs come optimized for four of the most popular social networks – Instagram, Facebook, Twitter and Pinterest. Snappa’s drag-and-drop editor, it’s quick and easy to create your own graphics for blog posts, social media profiles and ads. The tool provides access to more than half a million free stock photos, 70,000+ vectors and shapes, and 200+ fonts. It’s free to download up to 5 files per month, or $10 a month for unlimited downloads. As social media is ruling our life, social media exposure is now important for all business to gain online visibility. That’s why, the importance of social media marketing has become very vital nowadays.